"When people questioned if I was a women or a man, it was a tough time. I didn't want to show my face in public for about 10 years. It took me that long to understand the situation. I'd work from nine to five in a shop then at five come home and slam the door on the world. So I have so much respect for this girl, to have run the race like this. I couldn't have lived through a story so brutal. I would have retired." - Andreas Kreiger (formerly Heidi) on Caster Semenya. After retiring from sport, Kreiger had gender reassignment surgery after being part of the East German state-sponsored steroid program at a young age. LRC Men's 1,500 And Women's 800 Semis Recap: American Men Put 3 in the Final, All 3 American Women Go Out It was polar opposites for the Americans as three made the 1,500 final and none made the 800 final. Pamela Jelimo dropped out while Leo Manzano almost outkicked Asbel Kiprop. Usain Bolt ran a stunning 9.58 and Tyson Gay a very game American record 9.71. 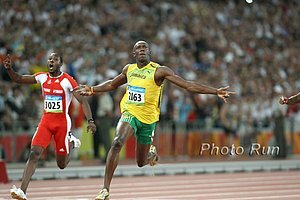 LRC Commentary: Usain Bolt Superhuman, Tyson Gay ... We try to come up with words to give some perspective to Bolt's 9.58 and Gay's 9.71. 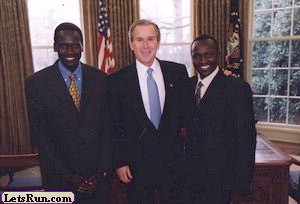 Darvis Patton may have said it best: "There are no words to describe him (Usain Bolt). He's like a created game person. He's like a cheat code. That's how good he is ..." Monzavous Edwards compared Bolt to Michael Jordan BEFORE the record run. Plus post-race interviews and more. Men's 400m Hurdles Torch Officially Passed As Clement Wins 2 In A Row - Felix Sanchez Last - 17-Year-Old 4th Clement looked amazing and Batman Jackson charged hard for third running on an injured hamstring. 17-year-old Jehue Gordon's time of 48.26 moves him to #2 all-time for juniors. Women's 400: Sanya Gets Monkey Off Her Back, US On A Roll Jamaican-born Sanya Richards (the most prolific producer of sub-50 times in history) ran a world leader in the final in a brilliant tactical race to get her first individual WC or Olympic title. She executed her and coach Clyde Hart's strategy with a big move in the 3rd 100m to run away from a talented field. 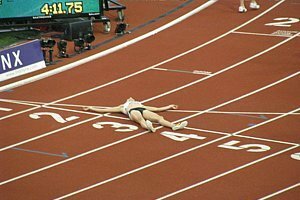 Brit Christine Ohuruogu couldn't get up for a medal. Richards: "I enjoyed every step of my race." Men's TJ: Idowu Joins Ennis As GBR First-Time Gold Winners Despite being way behind the board, Britain's Phillips Idowu jumped a clutch personal best and world-leading performance in the final to get the gold he has been talking about for a long time over Portugese Nelson Evora. W Jav: Germany's Steffi Nerius Wins First Global Title In Her Final Competition Before Retirement Really her javelin win is a fairy tale story. Tyson Gay Decides Not To Run 200m - USATF And Doug Logan Release Statement Of Support To perform like he did while not 100% is absolutely amazing. After 2 golds in 2007, Gay has had to fight hard just to medal. 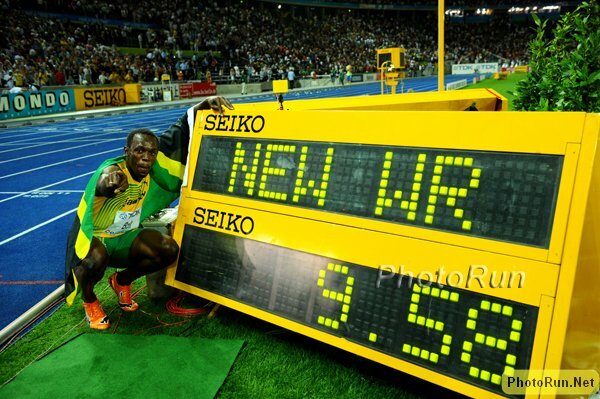 Bolt's 100m The Best-Ever Track And Field Performance According To IAAF Charts 9.58 equals a 1:38 800m! USA Hero Chelsea Johnson Scores Pole Vault Silver Chicago Tribune's Phil Hersh writes about the daughter of 1972 Olympic bronze medalist Jan Johnson. Isinbayeva: "I have no explanation for this." One of the world's most recognizable athletes couldn't clear a single bar. She put her head in her hands, got herself together and waved to the crowd while Poland's Anna Rogowska celebrated her 2nd straight win over the Russian. Triple Bogey: Hungary's Kristian Pars Has 18-Meet Win Streak Snapped By Olympic Champ Kozmus In Hammer If you got to watch the meet online, this event was awesome. Massive Kozmus became the tiny country of Estonia's first world champion while Pars choked. Castros Happy: Cuba Goes 1-2 In Women's Triple Jump Their male triple jumpers were at one point the best in the world, but their form has fallen. The women (Yargelis Savigne and Mabel Gay) dominated. Pole Vault Surprise Isinbayeva No-Heights But American Chelsea Johnson Wins Silver! 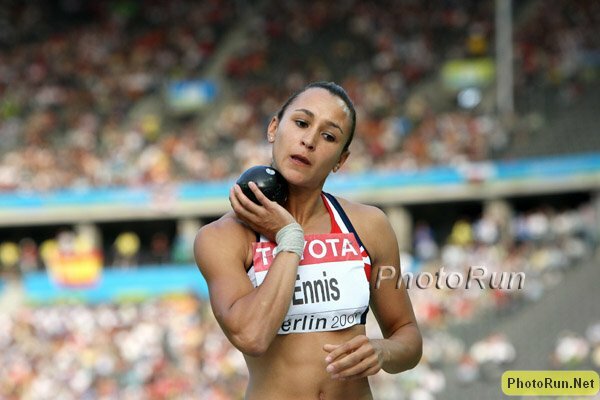 LRC Worlds Sunday PM Recap We cover the women's shot put, heptathlon, 400, 100 and men's 400 hurdles semis that were just as crazy as the first round. LRC Men's 10k: A Day After Bolt's Electric 100m Run, Bekele Reminds Us He's Even More Dominant Than Bolt Kenenisa Bekele remained undefeated at the 10,000 meter distance for his life as he won in a championship record 26:45 thanks to a 13:05 2nd 5k. Eritrean Zersenay Tadese got a well-deserved silver after he put on a spirited front-running effort that would have broken anyone on the planet but Bekele. American Dathan Ritzenhein ran the race of his pro career to move up to 6th in 27:22 as Galen Rupp faded to 8th and had to be helped from the track. LRC Women's10,000m: 9,950 Meters According To Form And A Very Bizarre Finish This race had it all. Craziness, stupidity, and drama - all in the final 50 meters. Recap, photos, and video interviews, plus interviews with Americans Amy Yoder Begley (6th in a PR) and Shalane Flanagan.